OKCU Broadway Revue Goes to Olathe, Kansas! No need to fly to New York or LA to enjoy professional quality musical theater dance. 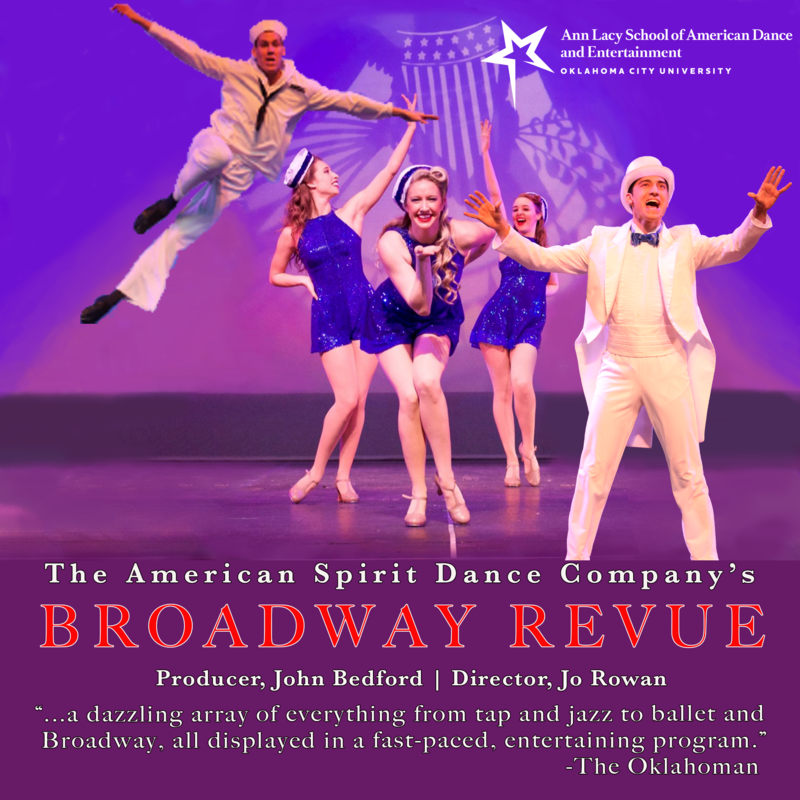 Celebrate American dance from Broadway to Hollywood with Oklahoma City University's American Spirit Dance Company, directed by Jo Rowan, as they bring the spring Broadway Revue of 2019 to a city near you! The American Spirit Dance Company will be traveling to Olathe East High School in Olathe, Kansas April 12-13. Show times are Friday, April 12, 2019 at 7pm and Saturday, April 13th, 2019 at 2pm. You can purchase tickets for $10 at www.oetheatre.com, all proceeds benefit Olathe East's Thespians Troupe. Touring is a special opportunity available to dance and arts management students at Oklahoma City University. Expenses for transportation, hotels, and meals are provided at no cost to the students on tour. Overseas tours have taken the company to Taiwan for performances at the National Academy of Arts, the University of Chinese Culture, National Physical Education College, Taipei Physical Education College, Hsinshu Performing Arts Center, the Taiwan Police College, and performances at the Central Newspaper agency in the heart of Taipei. American Spirit Lite, the smallest performing component of The American Spirit Dance Company, performed in Beijing and Langfang City, China, to full houses. The American Spirit Dance Company has also toured to Southeast Asia for performances in Kuala Lumpur, Malaysia, in venues such as The Palace of the Golden Horses as well as the Kallang Theatre in Singapore. Within the United States, the American Spirit Dance Company has performed in many Oklahoma and Arkansas communities; for the USO in Pensacola, Florida; and in Los Alamos, New Mexico; Peoria, Illinois; and Woodbury, Tennessee. An account of the 1999 Asian Tour to Malaysia and Singapore was published in the April 2001 Dance Spirit magazine.